Crime scene cleanup includes blood spills following an assault, homicide or suicide. There are many different sub-segments, named primarily after additional collateral, contingency, or preconditions, regarding the presence of non-blood borne organics, toxic irritants (e.g., tear gas) or disease vectors. However, it is the legality of charging a fee for mitigating potentially harmful biohazard situations that differentiates a registered crime or trauma practitioner from any general restoration, carpet cleaning, janitorial or housekeeping service. The crime scene cleaners' work begins when the coroner's office or other official, government body releases the "scene" to the owner or other responsible parties. Only when the investigation has completely terminated on the contaminated scene may the cleaning companies begin their task. In video games and visual media, crime scene cleanup takes center focus as the main objective in the game, Viscera Cleanup Detail. Viscera Cleanup Detail is a PC game distributed through Steam that enables players to clean up blood and body remains after a Sci-Fi battle has occurred on a space station. Another example of crime scene cleanup in video games is Safeguard. Safeguard takes a more realistic and educational approach, enabling users to learn about the hazards of crime scene cleanup, as well as the equipment and tools used. Safeguard also uses virtual reality to immerse users in the crime scene environment. 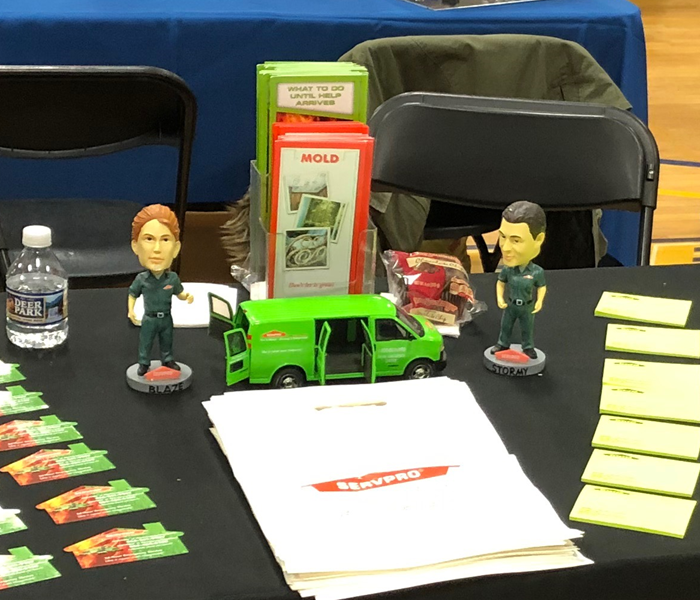 SERVPRO of Washington/Woolwich attended a great job fair on Friday. At Rowan University at Gloucester County. There was 175 vendors there and a really good turn out of job seekers. This is one of the biggest job fairs in this area and it was our honor to be asked to be a part of it. When posting this picture, I noticed that the heads of the bobble heads were on the wrong bodies, Stormy was on Blaze and Blaze was Stormy!! April fool's joke? Maybe, but I found it and it won't happen again on my watch. 6 Disasters, Home/Property Insurance Won’t Cover! Other sources of backups include pipelines that handle both storm water and raw sewage — and become overwhelmed in rainstorms — and blockages from tree roots that work their way into sewer-line cracks. Properties constructed primarily of wood are not the only structures threatened by termite activity. Properties made from other materials may also host termite infestations, as these insects are capable of traversing through plaster, metal siding and more. Termites then feed on cabinets, floors, ceilings and wooden furniture within these homes. This can be especially helpful if you are currently constructing a home. These are metal shields put along the foundation of your home to deter termites. These should be made of a non-corroding metal with no gaps. This can prevent termites from getting access to the wood foundations or structures of your home. * Limit movement in the home to prevent soot particles from being embedded into upholstery and carpets. * Keep hands clean. Soot on hands can further soil upholstery, walls and woodwork. * Blow or brush vacuum loose soot particles from upholstery, drapes and carpets. * Place clean towels or old linens on rugs, upholstery and carpet traffic areas. * If electricity is off, empty freezer and refrigerator completely and prop doors open. *Clean and protect chrome on kitchen and bathroom faucets, trim and appliances with light coating of Vaseline or oil. * Wash house plants on both sides of leaves. * Tape double layers of cheesecloth over air registers. * Attempt to wash any walls or painted surfaces without first contacting your SERVPRO Professional. *Attempt to shampoo carpet or upholstered furniture without first consulting your SERVPRO Professional. *Attempt to clean any electrical appliances, TV sets, radios, etc. that may have been close to fire, heat or water without first consulting your SERVPRO Professional. * Turn on ceiling fixtures if ceiling is wet. Wiring may be wet or damaged. *Send garments to ordinary dry cleaner. Improper cleaning may set smoke odor. I just bought my first home. Unlike most homebuyers who are looking for an open floor plan or a gourmet kitchen, my first stop was always the basement! My favorite time to look at houses was in the rain, when I could determine if the basement was prone to flooding. Several times, I walked into a house's basement and watched as water ran down the walls. Obviously, frequent water intrusion in your basement can cause issues with your foundation, and mold. But most people don't know what to look for or how to protect their basement until after they've experienced a water damage. What's obvious to me as someone who has worked in the restoration industry for 4 years may not be obvious to every homeowner, so here are some tips to help you stay dry! Get a sump pump. Get the sump pump rider on your insurance policy while you are at it. 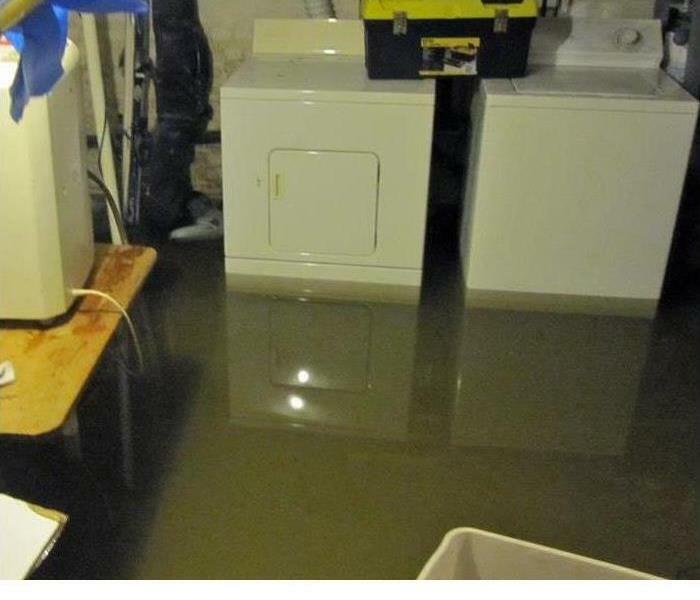 If you have a sump pump and it fails, your homeowners insurance will not cover the damage. Even if your home or business has never taken on water, it doesn't mean you are immune to it. Get the sump pump and check that it's functioning properly regularly. Consider a French drain or some other form of waterproofing. Have a professional do the work. Google the benefits. You may be surprised! Keep your gutters free of debris and position downspouts away from the foundation. The goal is to drain water at least three feet away, so if necessary, consider running extensions or troughs. If you haven't had your sewer inspected or your septic tank cleaned, now is a good time to do that. During periods of prolonged, heavy rainfall, clogged sewers and over-taxed septic's are disasters waiting to happen. If you have below-grade basement windows, install window covers that fasten securely to your foundation. Clear acrylic covers allow light to enter while keeping out water. Check the age on your hot water heater. They generally last about 10 years. If yours has made it longer, that's not necessarily a good thing! Don't wait for it to fail before you replace it. If you use your basement for storage, build shelves at least 6 inches from the ground. Store items in plastic bins. Photograph everything you store down there in case you need to replace it later. If you have a finished basement, get a good-quality dehumidifier. Consider tile floors or polished concrete over carpets. Ventilation systems can often be the biggest culprit of poor indoor air quality because many people allow HVAC systems to operate for some time without much attention or upkeep. Your HVAC system could be circulating odors, dust, and other contaminants throughout your property. A routine part of SERVPRO of Washington/Woolwich service is inspecting the heating, ventilation and air conditioning unit (HVAC). Keeping the HVAC system and ductwork clean can potentially extend the life span of the equipment by allowing it to operate at peak condition, which can in turn save you money and give you cleaner air to breathe. * Mold spores are microscopic and float along in the air and may enter your home through windows, doors, or AC/heating systems or even hitch a ride indoors on your clothing or a pet. * Mold spores thrive on moisture. Mold spores can quickly grow into colonies when exposed to water. These colonies may produce allergens and irritants. * Mold often produces a strong, musty odor and can lead you to possible mold problem areas. The Difference When Your Ducts Are Clean.. TIP:Do you want to get rid of unusual odors that linger in your kitchen sink? Freeze vinegar in ice cube trays before running them down the disposal. The ice will sharpen the disposal blades and the vinegar will kill odor-causing bacteria. If you have black mold covering a large area (greater than ten square feet) or mold growing in your heating and ventilation ducts, the Environmental Protection Agency recommends having a professional handle the cleanup. It’s also best to have a professional handle the job. SERVPRO of Washington/ Woolwich is a trusted leader in the restoration industry, and our highly trained technicians provide 24-hour emergency service. We're dedicated to responding faster to any size disaster with the training, equipment, and experience to respond to your restoration or cleaning needs. 24-Hour Emergency Service Faster to Any Size Disaster Highly Trained Restoration Technicians A Trusted Leader in the Restoration Industry Locally Owned and Operated Advanced Restoration and Cleaning Equipment Mold remediation, water damage, fire damage. 3/28/2019 - 6 Disasters, Home/Property Insurance Won’t Cover! 2/8/2019 - The Difference When Your Ducts Are Clean..